This volume collects the first six issues of the hit comic book series published by Image Comics. The story is about six new students at Morning Glory Academy, an extremely prestigious private school with, it turns out, a sinister underbelly. The main character is Casey, blond, beautiful, and brilliant at physics. She is joined by her roommates Zoe, a spoiled brat kleptomaniac, and Jade, a small-town writer with a troubled past. As for the boys, there are Hunter, likable but nerdy, Jun, quiet and strong, and Ike, who is privileged, manipulative, and hedonistic. Together these students try to get to the bottom of their teachers' plans, explore the school, escape death traps, and figure out why they are there. The mystery and rebellion aspects as well as the characters' interactions make for some compelling storytelling. This hit series is the work of writer Nick Spencer, who has worked on numerous series from DC, Marvel, and Image Comics. This interview with Comic Book Resources' Josh Wigler gets at the origins and early direction of the series. Joe Eisma provides the interior artwork while Rodin Esquejo illustrates the covers. Eisma spoke with Newsarama about his work on Morning Glories, and all three creators weigh in about the series here. 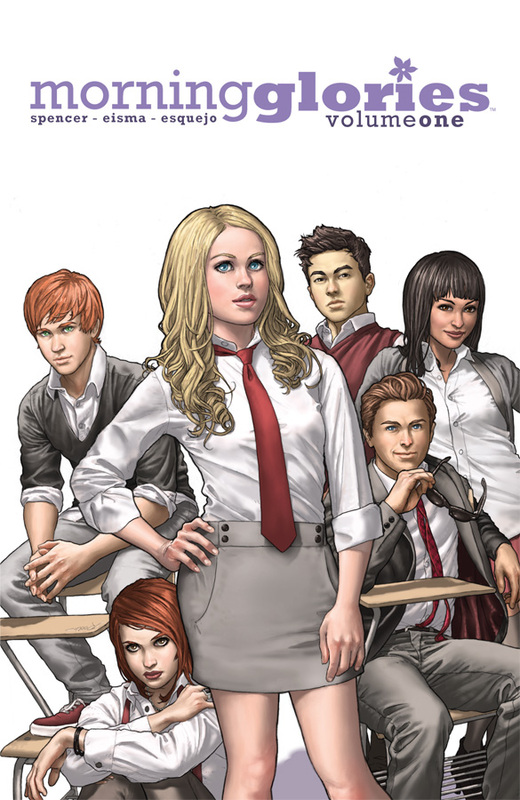 Morning Glories has received much positive attention, including an Eisner Award nomination for writer Nick Spencer and a YALSA nomination for Great Graphic Novels for Teens. The Tuscon Citizen's Rob Acosta wrote that Spencer has created an immediately intriguing story and that the twists and turns in the plot have really hooked him. IGN's Miguel Perez wrote that this is a series "to make the rest of the comic book world stand up and take notice." CBR's Chad Nevett noted that Eisma's art struggles to keep up with Spencer's plot but added that the writing is "fearless here and makes me wonder what’s in store as the series continues." An 11-page preview is available from Comic Book Resources. This adaptation of Oscar Wilde's only novel conveys a streamlined version of the original work. 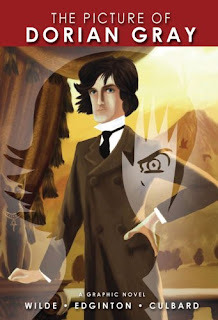 Dorian Gray, a handsome and narcissistic man, commissions artist Basil Hallward to paint a portrait of him. Taken with himself and his desires, Dorian sells his soul so that the portrait will age and change while he himself remains youthful and attractive. Given to hedonistic tendencies, Dorian lives according to his appetites, regardless of the consequences for others. Over time, his sinful lifestyle is reflected in the painting, which becomes hideous and marked with age. After eighteen years, however, his actions start to catch up to him. This graphic novel is the work of Ian Edginton and I. N. J. Culbard, who were the creators behind a series of Sherlock Holmes adaptations. Their work has a modern feel that evokes emotion through stylized faces, pointed phrases, and a muted, frosted aspect of the artwork. I feel the art is wonderfully expressive. Culbard blogs more about his work here. Reviews of this book have been mostly positive but with some reservations. The Comics Journal's Kristian Williams examines several graphic adaptations of Wilde's novel and opines about this version that too much of the original wording "has been pruned from the dialogue, and so Lord Henry Wotton’s philosophy is reduced to a series of clever inversions and bold affronts to common sense. Likewise, the art, while very good, cannot but clash with the Victorian setting." This short review from the Do Even I Dare to Speak? blog states that "the graphics are fairly simplistic and the writing is just average." More reviews can be found at Goodreads. This book was published in the US by Sterling Children's Books. A preview is available from Self Made Hero. Congratulations 2011 Eisner Award Winners! Yesterday at Comic Con International, Wilson and Return of the Dapper Men shared the award for best original Graphic Album. I have mixed feelings about having a tie for such an award, but both books are excellent and worthy. In other news, Chew won Best Continuing Series. Smile won Best Publication for Teens. And Naoki Urasawa's 20th Century Boys won for Best US Edition of International Material-Asia. Additionally, Harvey Pekar was among those elected to the Hall of Fame. Sarah Glidden has received numerous awards and accolades for her work in minicomics, including the 2008 Ignatz Award for Promising New Talent. She is an American-born artist, and this book is her first major endeavor. These interviews with Douglas Wolk, Samuel J. Scott, and Michael Cavna shed more light on her life, politics, and work. 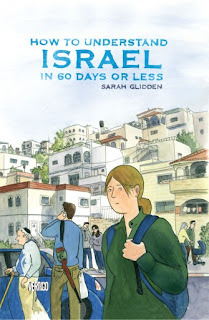 How to Understand Israel in 60 Days or Less is a mediation about the politics and reality of Israel in the face of constant conflict with Palestinians and surrounding Arab nations. Glidden visited Israel in 2007 for a ten-day "birthright tour." She comes in expecting to find much pro-Israeli propaganda, as she is more sympathetic to the Palestinian side of the conflict. Instead of a simple bully-versus-victim situation, she comes to see many aspects of the historical happenings and political realities. She wrestles with her beliefs often, in fictional scenes depicted as a fantastical courtroom. She visits a great many places on the tour, including Tel Aviv, Kinneret, the desert, Golan Heights, and Jerusalem, learning about their historical import as well as their current statuses. Afterward, she stays for some more time, trying to get a less filtered, more real view of Israel by visiting the West Bank, but still no clarity emerges. This intriguing volume contains much material to debate about regarding the politics of Israel, and it acts as a treasure trove of information not only within the actual narrative but also in the helpful glossary and timeline at the end of the book. I felt that the story was a fine combination of nonfiction and fantastical elements that was dense at times, but appropriately so according to the subject matter. The reviewer at Jewlicious found the plot very compelling and read the book in one sitting. Jen Sorenson called the book "a particularly effective piece of graphic storytelling," noting that the fictional courtroom scenes helped her pull the story and arguments together well. Kelly Thompson does not know if she is any clearer about the Israeli/Palestinian situation after reading it but noted that she was moved by this well-crafted graphic novel. This book is published by Vertigo, and a preview of it is available from TIME magazine's Techland. 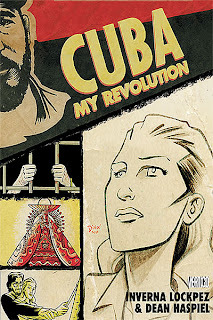 Cuba: My Revolution is not strictly factual, as the main character is a stand-in for the author named Sonya and some of the other characters are composites, but the events it portrays are based on Lockpez's experiences. Sonya is a budding artist who is swept up in the romantic, hopeful message spread by Fidel Castro in overthrowing the Batista regime in Cuba. Hoping to pitch in with the freedom fighters who had cast off American-backed oppression, she became a doctor. Over the course of time, she finds that not all of the utopian ideals and proposed reforms went as she hoped. Instead of a socialist paradise, a Soviet-style communist dictatorship ascends. She sees an atmosphere of continued conflict, paranoia, and want under Castro's rule, which makes her question her choices and allegiances. The author Inverna Lockpez is an artist who has been showing sculptures and paintings internationally since the 1960s. She has been friends with cartoonist Dean Haspiel for years, telling him her stories. After he kept telling her she should share her experiences with others and she saw his work with Jonathan Ames on The Alcoholic, she agreed to co-create this graphic novel. This interview sheds light more on their collaboration. Haspiel has been making comics for years, and is well known for his work on The Quitter, the webcomix collective Act-I-vate, and the Emmy Award winning titles to the HBO series Bored to Death. This interview touches on his work on this book. Reviewers have found the story very moving and well executed. Evelyn Finch wrote that it is "a passionate, profound and compelling piece of work that will stay with you long after you put" it down. David Pepose appreciated how Sonya evolved over time and concluded that it "has the potential to be an important" book. Jesse Schedeen opined that the story is personal, compelling, and affecting, though the ending did not feel very climactic. I found the story to be gruesome, powerful, and emotionally charged. Additionally, Haspiel's clear, strong lines contributed to impressive imagery that is highlighted by the limited color palette of black, white, and red. Cuba: My Revolution was published by Vertigo. Previews are available from Techland and Big Shiny Robot. The Young Adult Library Services Association's 2012 Great Graphic Novels for Teens Nominations are out! Among the nominees are Anya's Ghost, Thor: The Mighty Avenger, Return of the Dapper Men, and Astronaut Academy: Zero Gravity. People today know lots about dinosaurs, to the point where children can become experts in names, eras, habitats, and probable behaviors at early ages. But 150 years ago during the Gilded Age things were very different. Only 9 species of dinosaur were known in North America then, but two men became involved in a conflict that changed that situation. After a brief collaboration, E. D. Cope and O. C. Marsh waged what was later known as the Bone Wars, striving to locate, obtain, and analyze fossils all over the US, particularly out west, and name as many new species as possible. Their falling out precipitated from an error Marsh publicly pointed out about Cope's reconstruction of an Elasmosaurus skeleton, with the head being placed on the tail instead of the neck. In their haste to discover new species, they turned to dirty tactics, including throwing rocks at each other from their excavation sites, dynamiting sites, destroying fossils, deliberately relocating fossils, filling in excavation sites, and savaging each other through personal attacks in journal articles. The feud spread to the popular press and became quite a sensation. Cope had a head start and some fortune of his own but Marsh had a large inheritance plus the resources of Yale University funding his work. In the end, Marsh named 80 species and Cope 56. Among their findings were some of the most well-known dinosaurs, including Triceratops, Stegosaurus, Allosaurus, and Diplodocus. Along with their discoveries, there were also a number of misconceptions because of their haste to outdo each other, which took decades to suss out. 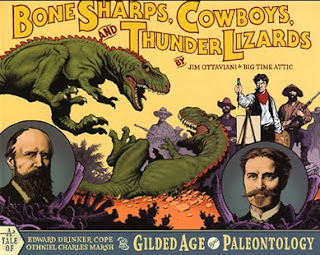 This graphic novel covers a lot of ground and also shows this duo's interactions with a number of historical figures, including Charles R. Knight, who went on to create some of the first and most recognizable dinosaur paintings; P. T. Barnum, who gathered and bought curiosities for his traveling shows; President U. S. Grant, and Chief Red Cloud, with whom Marsh deals in order to get access to excavation sites. A copious back matter section helps delineate how much of this book is fact and how much is embellished (or not, it turns out). The product of Jim Ottaviani and Big Time Attic, Bone Sharps, Cowboys, and Thunder Lizards is their first collaboration, and they have since worked on the Space Race story T-Minus. Reviewers have largely enjoyed the book. Todd Klein found many of the intricate details in the art and lettering helped convey the story and set a tone, thought the huge cast of characters was sometimes confusing. Johanna Draper Carlson wrote that the politics made a potentially dusty story intriguing and that it was "Ottaviani's most entertaining book yet." Entertainment Weekly's Tom Russo felt the opposite, that the story needed more fictional embellishments. Personally, I felt the real drama made for a very compelling narrative that bears re-reading. An excerpt, study guide, and a list of reviews is available from Ottaviani's publisher G. T. Labs. Sherlock Holmes is one of the most famous literary characters ever created, and this graphic novel is an adaptation of his first story. In it, we meet Holmes' reliable friend and narrator, Dr. Watson and learn how he came to live at 221B Baker Street with the great detective. The pair end up involved in a murder investigation, and Holmes, years before CSI, uses science and deduction to figure out suspect, motive, and method. The solution of the mystery takes the reader to the United States during the early, rough days of the Mormon trek into Utah. 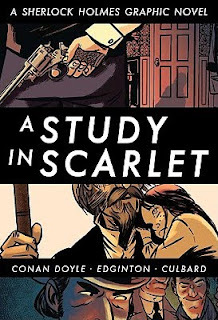 This graphic novel is a faithful adaptation of the work of Arthur Conan Doyle, a Scottish writer who wrote a range of other works such as the science fiction novel The Lost World, and who tired of his most famous detective, even killing him off at one point, but relented to public outcry for more Holmes stories. Ian Edginton, a popular British comics writer, adapted the story. He is known for his sequel to H.G. Wells' War of the Worlds, Scarlet Traces, and various runs on 2000 AD. The art was provided by I. N. J. Culbard, who has also worked on adaptations of a great number of classic British novels. In particular, he excels at creating mood via space and facial expressions. The reviews I have read have been overall positive. The Guardian's Rachel Cooke wrote that Edginton and Culbard did an excellent job and she "relished every page." Seth T. Hahne was frustrated that some clues were withheld before the great reveal so he could not solve the mystery on his own. School Library Journal found the book had much to offer new and established Holmes readers alike. I agree and think that Edginton and Culbard have done well capturing the spirit and tone of the original quite well. This book was published by Sterling. These same collaborators have created two other such adaptations of Doyle's detective, with a third on the way. Previews of this book and those later volumes are available here from Self Made Hero.